What makes us happy? Fox News says it's the little things in life. USA Today says it's dogs. MSNBC says it's not getting married. Forbes says it's working in Miami. Personally, I'm partial to cupcakes and swearing. All in all, when it comes to this very hot pursuit, everybody has an opinion. 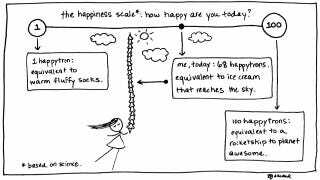 Not only that, the Harvard Business Review tells us that measuring happiness may be just as important as measuring our GDP, so I am pleased to present the Happiness Scale, based on careful research, for this sole purpose. So how happy are you today? Just make sure you figure it out and get it right, because World Happy Day is coming up.